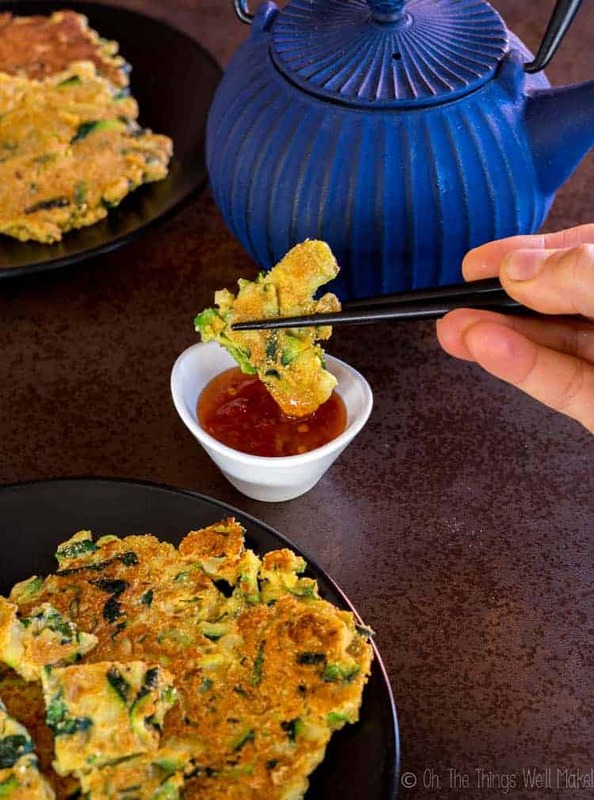 Easy Zucchini Pancakes (Hobakjeon) - Oh, The Things We'll Make! 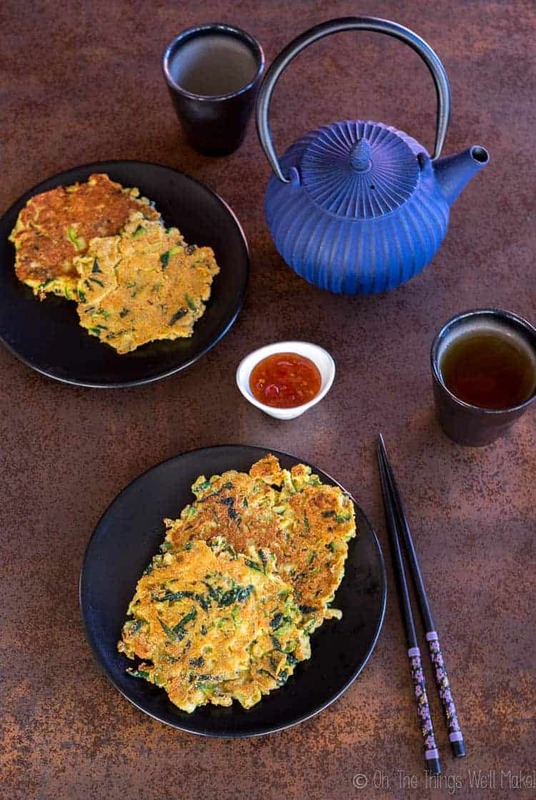 Perfect as a side dish or a light meal, these easy zucchini pancakes, also known as hobakjeon, have become one of my favorite tasty ways to use up excess zucchini. Today I'm happy to share with you another recipe from one of my friend bloggers. Some of them, like Emily Sunwell-Vidari's Basque chicken recipe, have been quite popular on the blog. I imagine that this one will end up being another favorite because it allows you to eat more veggies in a fun new way. In fact, I love this recipe so much that I've already made them several times since beginning writing this post! 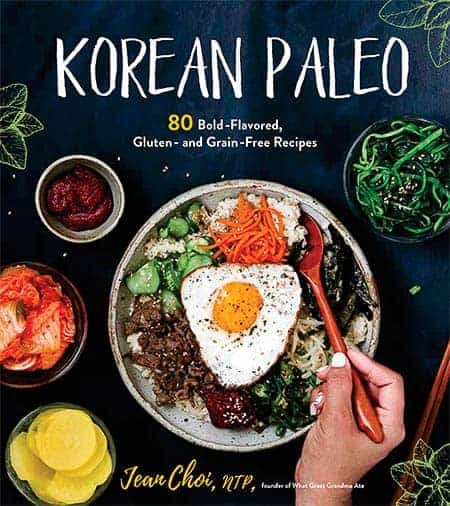 Today, I'd like to show off the book, Korean Paleo! written by Jean Choi, blogger at What Great Grandma Ate. When I heard about her new book, I was quite excited. You probably know by now that most of the time I follow a paleo type diet. If you've been following my blog for a while, you probably have also noticed that I have a fondness for all sorts of international recipes, and I have always loved Asian cuisine. In dental school, one of my best friends would bring me to the local Korean restaurant during our lunch breaks for what was normally bibimbap accompanied by kimchi and a bowl of miso soup. I loved going there. Because many of the foods served there were rice dishes, and not at all paleo, I was curious to see what Jean would be offering in her cookbook. Luckily, she kindly sent me a copy of the book to review. What can you find in the Korean Paleo! Cookbook? Jean's cookbook is filled with a wide variety of 80 Korean recipes that are gluten-free, grain-free, and soy-free. So many Korean dishes feature at least one of those, so this cookbook is quite unique and is perfect for those who want to enjoy their favorite Korean recipes without having problems with food allergies or digestive issues. Most of the recipes in her book are traditional type Korean recipes, but some are modernized, fusion, or are healthier versions of popular Korean fast foods. I was able to find a paleo version of my beloved Bibimbap and also was happy to see other favorites like Bulgogi, Kimchi, and some tasty looking Korean barbecue recipes. Many of the recipes were unfamiliar to me, but I love the opportunity to learn more and give them a try (as I hope you will do). 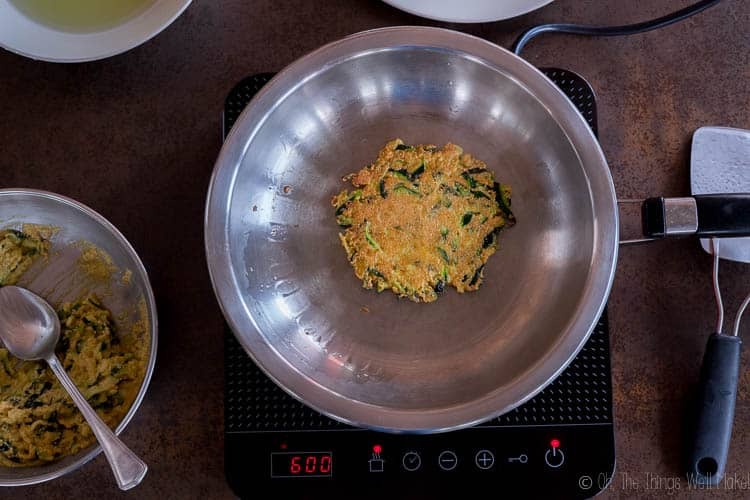 Cooking with Bap contains what are normally rice dishes, but she has adapted them using cauliflower rice. BBQs and So Much More contains her protein dishes. Jean wanted to show us that Korean food is more than just Korean barbecue. Piping Hot Soups and Stews includes mostly family-style soups that everyone at the table can share. Gooksoo Time! highlights grain-free noodles and spiralized veggie recipes. Not-Your-Typical Pancakes includes savory pancakes, like these zucchini pancakes, with vegetable and/or protein fillings. More Banchan Please? features side dishes and is one of the largest chapters of the book. In this chapter, Jean shares recipes for mini dishes that are often served with rice dishes in Korean restaurants. Something Sweet to Balance Out the Spicy shares creative and well known Korean desserts. 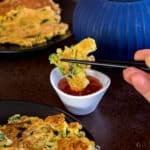 Korean Kitchen Must-Haves shares some Korean pantry basics and includes a lot of the sauces that you’ll want or need to make or accompany many of the other recipes. That's why Jean suggests that you start there, even though it's the last chapter in the book. Have food allergies? or follow another diet? While the book is already gluten-free, grain-free, and dairy-free, you may still be worried about other food allergies or intolerances. Or, perhaps, you follow a stricter diet? Zucchini is one of those vegetables (or is it a fruit?) that I happen to love… until I don't. 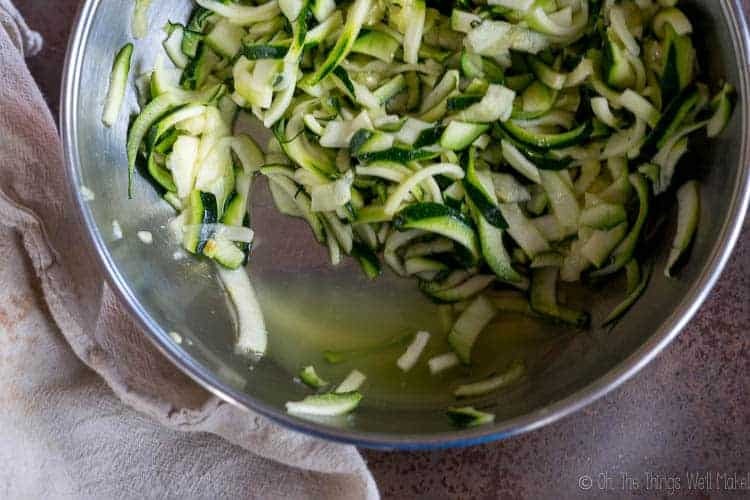 I go through times when I'm eating zucchini in just about anything and everything, and then I go through periods where I get sick of it because I just can't think of how to serve it anymore. That tends to happen at the end of summer when I have so many zucchinis in my garden that I just don't know what to do with them. That's when a recipe like this one is perfect. 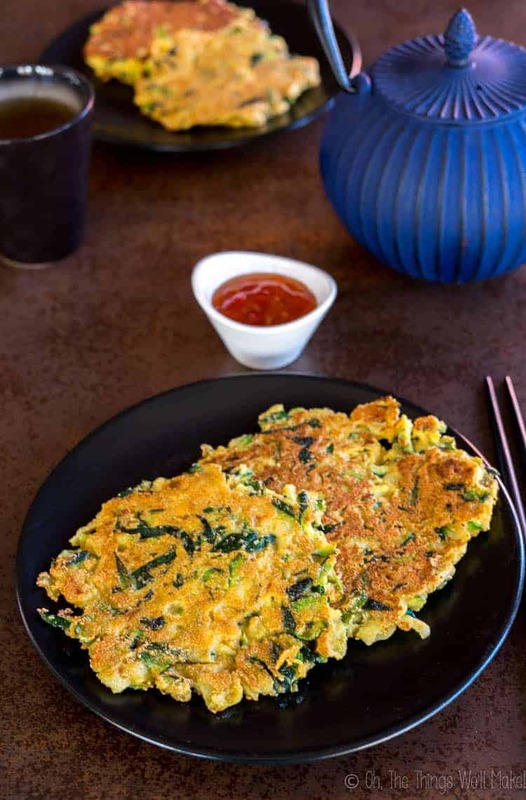 Hobakjeon are a type of Korean style zucchini savory pancakes. The name can also refer to pan-fried zucchini slices. 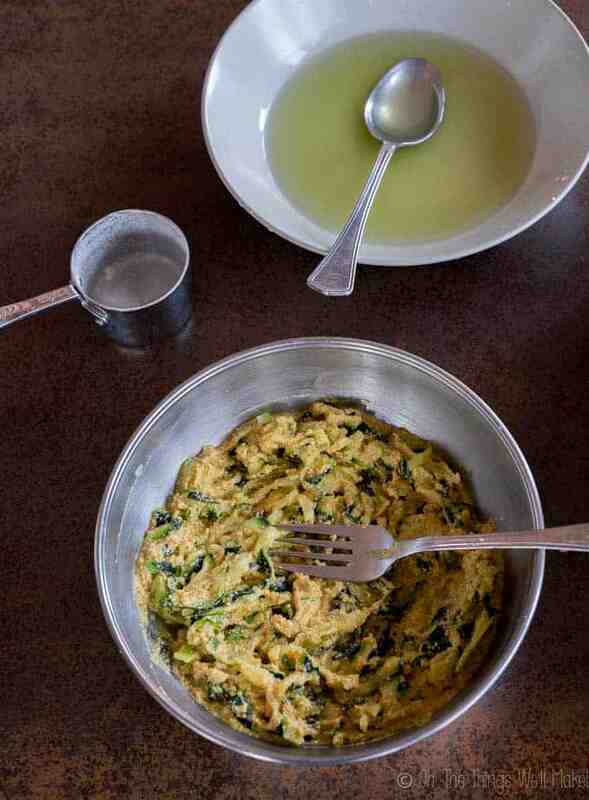 Either option uses a type of egg-based batter. Because Jean's book is a paleo cookbook, she chose to substitute the typically used wheat flour for cassava flour. They're delicious, and you definitely won't miss the wheat flour at all in this recipe. Cassava flour is a type of gluten-free flour that is derived from the yucca plant. Unlike tapioca starches that consist only of the starch of the plant, the term cassava flour usually refers to the flour obtained from grinding the whole, dried tuber. Recipe reprinted with permission from Korean Paleo by Jean Choi.